6.1 Effective Megapixels: 6.1 Effective Megapixel CCD for 3,008 x 2,000-pixel images. Compatible Lenses: D-type/G-type AF Nikkor: All functions possible; P-type Manual-Focus Nikkor: All functions except autofocus possible; AF Nikkor other than D-type/G-type: All functions possible except 3D Matrix Metering; AI-P Nikkor: All functions except 3D Matrix Metering and autofocus possible; Non-CPU: Usable in [M] mode (camera's built-in exposure meter does not work). Electronic Rangefinder usable with lens with maximum aperture of f/5.6 or faster; IX-Nikkors: cannot be used. Exposure Mode: Auto-Multi Program [P] (Flexible Program possible), Shutter-Priority Auto [S], Aperture-Priority Auto [A], Manual [M] ; Shutter speed/aperture adjustable in 1/2 or 1/3 EV steps; ISO Automatic Control Mode: Custom setting is available in any exposure mode (P, S, A, M); Top shutter speed: Top shutter speed of 1/4,000 sec. 3D Digital Matrix Image Control: 3D Digital Matrix Image Control for optimum results, ensuring faithful color reproduction with smooth gradation. 10-segment Matrix Metering; Three Color Modes: Photographers can choose from one of three color modes. Autofocus: Intuitive operation with 5-area autofocus. Flash: Built-in pop-up Speedlight features D-TTL flash operation. Flash sync speed up to 1/180 sec. 30 second long exposures. In the Box -- Supplied Accessories: Camera, Lens Cap, Camera Strap, AV Cable, EN-EL3 Rechargeable Li-ion Battery, MH-18 Battery Charger, LCD Monitor Cover BM-2, powerful Nikon software and a full suite of image editing software. Compatible with the The Coolwalker Digital Storage Photo Viewer: Store up to 10,000 digital photos on the 30GB hard drive and view them on the high-quality 2.5 inch TFT color monitor. Stores JPEG, TIFF and other major image file formats, including NEF files. AF NIKKOR (including AF-S, DX, VR and D-/G-type) : all functions supported. AF NIKKOR other than D-/G-type: All functions supported except 3D Color Matrix Metering and 3D multi-sensor balanced fill-flash. AI-P NIKKOR: All Functions Supported Except 3D Color Matrix Metering, 3D Multi-Sensor Balanced Fill-Flash and AF Supported. D-type Manual-Focus NIKKOR: All Functions Supported Except Autofocus and Some Exposure Modes. 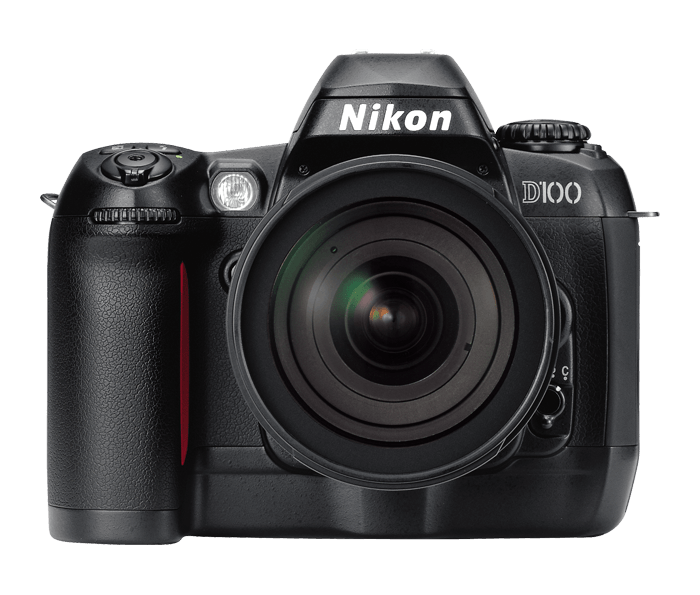 Non-CPU AI NIKKOR: Usable in A or M mode with Matrix, Center-Weighted and Spot metering. Indication of Aperture No., after user inputs the aperture f/No. and focal length by multi-selector. Non-CPU: Can be used in mode M, but Exposure Meter does not Function; Electronic Rangefinder can be used if Maximum Aperture is f/5.6 or Faster. SB-400: n/a, Not usable. No i-TTL function with these cameras, no custom setting option to control Manual output.